Why the guitar? Of all instruments, the guitar is the most versatile, popular, and portable. You can't lug a piano to a beach or park. When was the last time someone whipped out a clarinet at a party? Nearly everyone's family has at least one guitar lying around somewhere. With a guitar you can play single notes or chords, and you can play by yourself or with other musicians. And most importantly, you can use it to accompany singing. From a purely monetary perspective, getting started playing guitar is as cheap as can be. If you can't find a family member or friend to give you hers for free, you can easily pick up a very playable guitar new out of the showroom for $100-200. And if you're really budget conscious, you can find a huge second hand market on Craigslist or eBay where you can pick a guitar up for less than 50% of the new purchase price. Because there are so many guitars, supply is never a problem. Compare that with violins, horns, or pianos. Learning how to play the guitar simply isn't as hard as most people think it is. 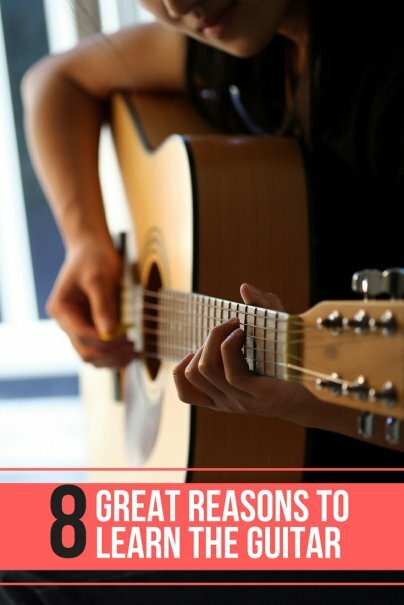 For the purpose of playing a few simple songs, anyone can learn to play within a month with some dedication and practice. Most popular songs are composed of the same ten or so chords, so once you learn the basic chord shapes, thousands of songs become available for you to play. Most pop songs are constructed from two to four chords. Learning guitar is easy in the beginning, and then gets deeper and more fantastic as you progress. When I started playing guitar, there was no such thing as the Internet. Each song I learned I had to either painstakingly deduce note for note by rewinding and trial and error, or I had to buy expensive published sheet music, which often was hard to understand. Today there are websites devoted to hosting tablatures of most any song. Type in a song name and add the word "tab," and you will easily pull a listing of free transcribed songs with lyrics. Furthermore, YouTube provides many free guitar lessons. Search for any guitar lessons, guitar styles, or song names; and you will probably find someone has already made a guitar playing video about it. The guitar is a social instrument. Across all cultures, people gather and play music. Most people have a hidden (or not so hidden) desire to sing. Normally shy people quickly open up after a few songs, breaking external barriers in the process. Music is magical like that. I once took a lightweight travel guitar around while traveling abroad, and I was surprised by how quickly I made friends with no common language other than music. Guitars are big enough to be seen when carrying or playing one, and playing gives an excuse for strangers to start a conversation with you (or for you to start one with a stranger)! With some songs under your belt and a few hot licks, you can then turn your attention to playing with others and/or performing — which is when the journey takes a marvelous turn. Start a rock band. Record a song and put it on the Internet for others to hear. Release an album. Perform at a local coffeehouse, singing your own songs. It's all free and easy with the Internet, and it will bring people and experiences that enrich your life like nothing else. One of the great things about playing guitar is that it is always there waiting for you, whether you're happy, upset, bored, or inspired. Through it you can give voice to your troubles or release built up physical tension after a stressful day. Unlike other hobbies, the very act of playing an instrument is a way to talk to and know yourself. Parts of yourself you didn't know existed will show themselves through music. Learn to know your true voice. You have one. Everyone does. But not everyone knows what it sounds like. This is perhaps the most important reason of all to learn. For guys: A French study has recently shown that merely holding a guitar makes you more attractive to women. Thirty-one percent of the women gave their number to the man with the guitar versus 9% and 14% for the gym bag and air respectively. And that's without ever actually playing the guitar! Imagine the benefits if you actually learn to play with skill and ease! On a personal note, I can attest that without the guitar I would probably not have had a chance with 50% of my girlfriends. Having such a worthwhile skill shows persistence, sensitivity, and hidden depths. A great first date idea is a guitar lesson indeed. OK, now go out pick up a guitar and bring more glorious music to the world! This is a guest post by Wolf Chen, a guitar player for 20 years. He runs a guitar pedals retail website at www.cheaperpedals.com. You can listen to some of his music at soundcloud.com/wolfchen. I agree whole heartedly.I spent 3 months playing for hours every day and can now belt out about 7 tunes and sing. Its taken your average night at a friends house to new levels with everyone singing along and sharing other songs. Probably the most valuable skill I've learned in terms of personal growth. Awesome article and very well written. Maybe I need to dust off my old one and give it another shot?